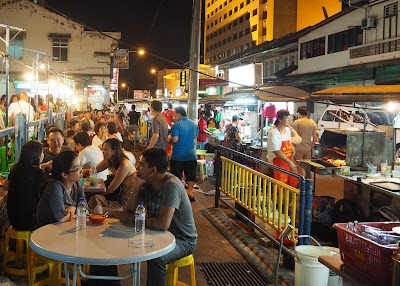 Even for a curious local Kuchingite like me, there are still places here I haven't been. One of these is The Bishop's House. I have seen it from afar, and always admired it's architecture. However it is the private residence of the Anglican Bishop of Kuching and generally not open to the public, so I tried to keep a respectful distance. Located behind the St Thomas Church, sitting on a small hill - The Bishop's House actually occupies one of the most prominent sites in Kuching town. From here you get a clear sight-line to the Astana, now the official residence of the Governor but in the old days the abode of the White Rajahs. I can imagine the old Bishop and the Rajahs greeting each other from afar in the mornings. The hill where Bishop's House stands is known as College Hill. The hill and the surrounding area which make up the Anglican Mission was given by Rajah James Brooke in September 1848 to Reverend Francis Thomas McDougall who arrived from England with his wife Harriette in the same year. The Bishop's House and Chapel were designed by Rev. McDougall himself and it was put together with local labour and materials under close supervision by a German shipwright carpenter named Theodore Auguste Stahl who found himself out of work after the ship he was employed on was shipwrecked in the Straits of Malacca. Rev. Mcdougall hired Stahl when they met in Singapore before heading over to Sarawak. Stahl's knowlegde of carpentry was to prove invaluable in the years to come. Stahl eventually married Elizabeth Richardson who was a maid to Harriette McDougall and even taught classes in industry and carpentry in the new school. He returned to Singapore with his wife in 1858 after spending 10 years in Kuching. The Bishop's House was completed in 1849. It is believed to be the oldest European-style dwelling house in Sarawak and the only building from the period of James Brooke still standing. The building has served a wide variety of uses since its first conception. 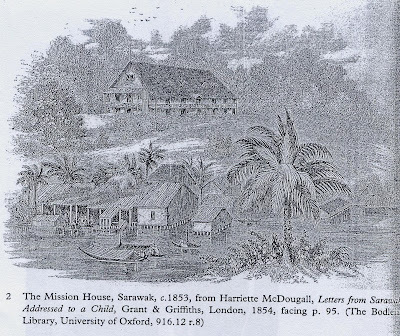 Not only was it the residence of the missionaries, it also served a role as school, store, dormitory, girl's and matron's rooms and the first dispensary in Kuching with Rev. McDougall as the doctor. It was most likely Rev. McDougall's role as a doctor which saved the Bishop's House from being attacked during the Chinese Miner's Rebellion on 18th February 1857. The rebels did not attack the building although they targeted all the houses of the Europeans. The Bishop's House ended up being a safe refuge during the terrifying few days for Europeans as well as converted Chinese Christians who feared for their safety. The Bishop's House was originally constructed all of wood. In 1885, the ground floor was reinforced with brick, mortar and plaster. In 1912 it was again renovated with the addition of a garage, bathrooms and a porch which was an extension of the sitting room upstairs. Today the Bishop's House serves as the Anglican Bishop's residence upstairs with his offices on the ground floor. Rev. 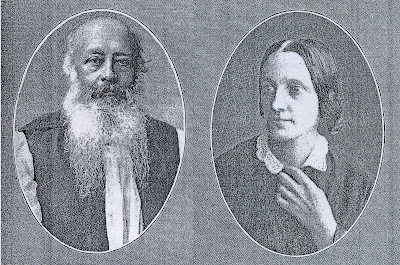 Francis and Harriette McDougall. 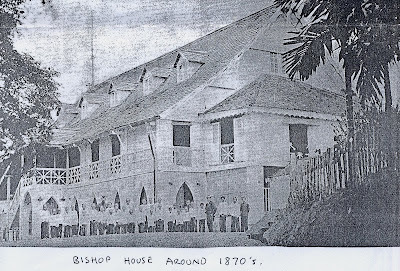 Old views of The Bishop's House. The house has undergone some renovations recently. Though it was not carried out strictly according to conservation principles, fortunately it is relatively intact. Evidence of shipwright carpentry in the details. Though The Bishop's House is not officially open to the public, the gates are usually open and it is quite easy to get into the compounds to take a look around. Just be very discreet. Don't forget next door is the Diocesan centre - the former family home of ONG Ewe Hai the prominent Hokkien trader (1830-1899). It sits towards the main bazaar with commanding views up river and across to the Astana.